History seems like a subject that should be straightforward, and yet it’s the most fraught corner of human knowledge. The ways stories are told, by whom, and according to whose interpretation, make all the difference. It’s how, for instance, a society of ruthless slaveholders who lost a major battle can be held up as triumphant champions of democracy if you find the right comics scribe and film director to give them an unquestioned hagiography. It’s how a vaguely homophobic action movie based on actual historical events can win Best Picture despite being bizarrely historically inaccurate about everything from the ages of its characters to the socioeconomic status of its grizzled hero. Even documentaries are not entirely immune from the human desire to engage in mythmaking. We’re always looking for a narrative, in history and in our own lives when the truth is that a lot of things happen for inscrutable reasons and no person or society fits easily into a neat little box. 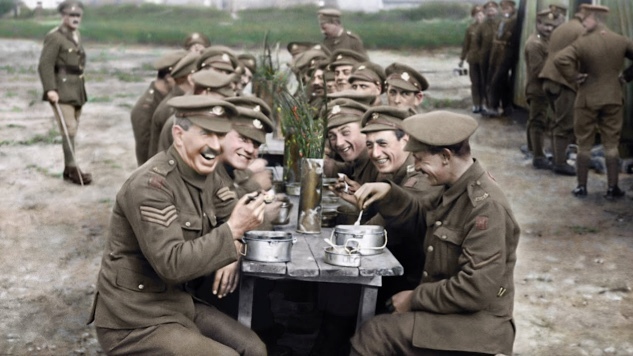 The incredible achievement director Peter Jackson and his team of restorers have pulled off in They Shall Not Grow Old is making that sort of narrative seem so real that any skepticism you have about it is totally overwhelmed as you’re watching it. It’s an unqualified triumph of film restoration, possible only thanks to the century of technology that separates its subject from the final result. Does Incredible Craft Matter When It Tells Just One Side of a Story? The documentary is built from the voices of World War I veterans reliving the conflict in their later years, cut over original video footage from the war provided by the UK’s Imperial War Museum to commemorate the centennial of the end of the war. We live in the world that World War I veterans won for us, for good and for ill. They’re all gone now, as their sons and daughters will be far too soon. Documentaries like these are now the only way we can get a glimpse into their experiences. The people who lived it aren’t around to illuminate us. That generation had the benefit of living on into a time when recording technology could preserve their recollections with some degree of fidelity. The film completely eschews narration, letting voice recordings of the British soldiers who served at the front tell their stories with no chyrons and little more in the way of structure than beginning at their enlistment and ending with their stories of returning home. The first stretches of the film are in rough black and white, and for this stretch, while the old men are narrating their experiences at boot camp, it looks very much like something you’ve seen in class. The hat trick of changing over to the footage that’s been fully restored, colorized, surround sound-designed and rendered into 3D, is somehow a reverse Wizard of Oz: The grim realities of the trenches and the front are the part of the film being made to seem real in comparison to the drab safety of home. With the painstaking craft used to imbue color and sound and some semblance of reality to the footage of these long-dead men, They Shall Not Grow Old all of a sudden becomes one of the most urgent documentaries of the past year despite focusing on a subject a century after the fact. Every shot of death and destruction, every scene of criminally young boys who lied their way into uniforms, seems to grab you by the shoulders and remind you that this happened and that we’re at risk of forgetting it as the march of time inexorably leaves it further and further in the past, that on some level, a generation who grew up on MTV and YouTube might never have really grappled with the reality of it to begin with. That’s Jackson and WingNut Films’ greatest achievement, even taking into account the sheer effort they must have gone through to match up the sounds of land mines going off or falling roof tiles dislodged by the concussion of artillery, the lip-readers they must have employed to figure out what was being said during the footage, to say nothing of having to endure the hours of graphic carnage and then spend hours of their day making it harder to look at it. They do it so well that tt wasn’t until a great way into the movie that the nagging sense of what was missing finally hit me, arriving as one of the soldiers described an unspeakably gruesome scene from the front which ended, as it had to, with him performing a mercy killing. This is the only time in the entire documentary where anybody can be heard to shed tears, or to express much ambiguity at all, and it highlights the only ambiguity I have toward the movie. Jackson is dutifully telling the stories of these soldiers. It’s personal for him, as he reminds us with his dedication to his grandfather, a veteran in the conflict. It’s also necessarily a telling that looks at only one side of the conflict, and a mostly gung-ho one. It doesn’t deny the horrors of the war or the brutality and randomness of it, but it also doesn’t really turn the lens on anything that complicates the men who fought it. It obviously doesn’t try to do that, and couldn’t, being a product of a government entity like the Imperial War Museum. It is not to diminish Jackson’s achievement or those of the men he’s lovingly remembering to say that They Shall Not Grow Old is only telling one side of a complicated story. In this case, it’s being told in an unforgettable way. Kenneth Lowe is regular contributor to Paste Movies. You can follow him on Twitter and read his blog here.